The historic buildings along the Rue Saint-Paul in Old Montreal, Quebec in Canada date back to the 19th and 20th centuries. The architecture of these buildings is amazing which one will see as you stroll along this street exploring the shops and the beauty of Old Montreal. The cobbled street winds its way through the buildings with flags displayed on some of them, signs on others and greenery growing up the facade of others. 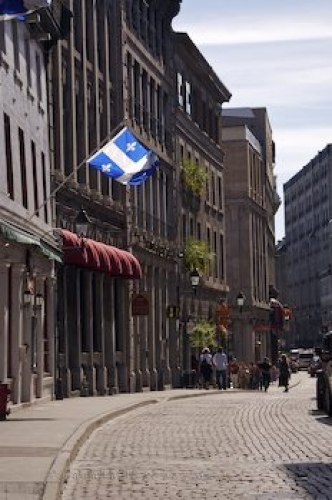 On this particular summer day, the historic Rue Saint-Paul is rather quiet as only a few people are seen hovering about. Rue Saint-Paul in Old Montreal, city of Montreal>, Quebec, Canada. Picture of the historic buildings along the street, Rue Saint-Paul, in Old Montreal, Quebec.